SG-1 returns from a mission and discovers that metamorphic aliens have taken over the complex. It’s been a cold, wet mission for SG-1, looking for Amonet’s Harcesis child on the planet told to Daniel by Sha’re (“Forever In a Day”). They are ordered straight to the infirmary by General Hammond, where they are conspicuously given injections that render them unconscious. Teal’c awakens later — the injection was not strong enough to put him out, thanks to his Goa’uld larval symbiote. He overhears General Hammond speaking with Dr. Fraiser, with two aliens standing with them. They are discussing invasion plans, and state that Teal’c and Carter could not be used by the aliens because of the symbiote within Teal’c, and the fact that Carter’s body chemistry had been changed by having once been joined with a Goa’uld (“In the Line of Duty”). Teal’c realizes that the S.G.C. has been invaded by aliens who can mimic the S.G.C. personnel in appearance, sound — even memories. He moves to escape, freeing Carter in the process. Carter escapes the facility and contacts Colonel Maybourne at the N.I.D., warning him of a foothold situation at the S.G.C. and arranging a meeting in Washington, D.C. Teal’c buys her escape by resisting the aliens, and is recaptured by the aliens. Maybourne is contacted by General Hammond, who tells him that Major Carter was exposed to a chemical accident and is suffering from hallucinations and delusion. He finds this more plausible than Carter’s alien-infiltration theory, and turns her over to aliens posing as Jackson and O’Neill. The four of them board a plane to return to Colorado, where the plane’s engines interfere with the alien cloaking technology. Carter grabs Maybourne’s sidearm and shoots the alien posing as Colonel O’Neill, exposing him and the truth to Maybourne. Also on the plane is an alien posing as Major Davis, who is also shot by Carter. After the aliens are dead, the real O’Neill and Davis awaken back in the S.G.C. They escape and subdue the alien Dr. Fraiser, and meet up with Carter, who has returned to the S.G.C. Carter goes to her lab to find a sound at the same frequency as the plane engine, in order to disrupt the alien technology. She succeeds, broadcasting the sound through the base intercom system. The aliens are revealed to SG-1 and to Maybourne’s forces, who are invading the base. Realizing their plan has failed, the aliens dial up the Stargate and move to escape. Carter and O’Neill reach the control room and shut down the Stargate before they can all get through. The alien leader then activates a device on his chest, and gives a farewell speech in an unintelligible language before he explodes, taking the rest of the aliens in the gate room with him. The other aliens on the base are soon found to be dead as well. With the threat neutralized, the team theorizes that the aliens attacked SG-6 on an off-world mission, and returned to Earth impersonating them. As for the aliens who escaped through the Stargate: if they are still alive, they have acquired a frightening amount of knowledge about Earth and the S.G.C. facility. 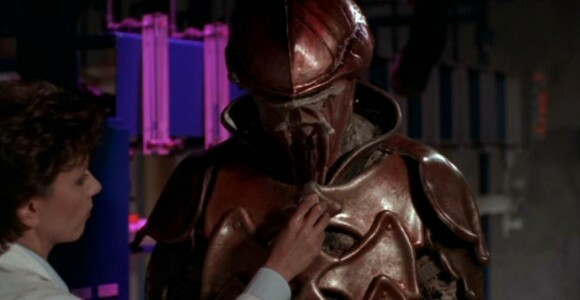 Major Carter theorized that Amonet’s Harcesis son (“Secrets”, “Forever In a Day”) may be able to communicate at a much younger age, because he already contains the knowledge of the Goa’uld. Based on the conversation Teal’c overheard between the aliens posing as General Hammond and Dr. Fraiser, the aliens are from another galaxy (Fraiser referred to the Goa’uld as “the dominant parasitical species of this galaxy”) and are searching for a new home. Their infiltration of the S.G.C. was an effort to evaluate the planet’s potential for livability before an invasion. The aliens were knowledgeable enough about the Goa’uld to detect the traces of Jolinar in Sam’s body, and to know that they are the “dominant parasitical species of this galaxy.” This implies that the aliens have incurred elsewhere in the galaxy, and may have even met the Goa’uld in the past. This is at least the second time that Teal’c’s larval Goa’uld and Sam’s having been joined with a Goa’uld have kept them from being used by aliens. The Gamekeeper of a virtual reality world could not tap into their experiences for this same reason (“The Gamekeeper”). Carter notes that the S.G.C. facility was designed to keep people out, not in. She seems to find her way back into the base rather easily, however. It is likely that the aliens did not replace every single person at Stargate Command. Some of the soldiers that Teal’c subdues bleed human blood. In addition, the man who discovers the elevator operator unconscious checked for his cloaking device — presumably to determine whether he was a human or an alien. After replacing the base officers and several soldiers, it would be easy to maintain the deception without replacing everyone. The aliens who escaped Earth — if they are still alive — know a great deal about Earth and the S.G.C. At the very least, they know the layout of the facility, the command structure, the resilience of the Goa’uld larva, S.G.C. procedure, and probably at least some of the memories of the facility personnel. They can also operate a Stargate. Other aliens to attempt an incursion through the Stargate within the S.G.C. : the “Spirits” (“Spirits”) and the Re’tu (“Show and Tell”). Apophis’s young soldiers were also planning such an attack of subterfuge (“Rules of Engagement”). Major Davis is not an S.G.C. officer, but is a liaison from the Pentagon. After the aliens took over the S.G.C., the alien posing as General Hammond asked him to come to Cheyenne Mountain. Presumably, the Pentagon was the aliens’ next goal. SG-1 should have the address of the planet to which the aliens escaped in the computer system. It would be pertinent for them to pursue. Amonet sent her son, a Harcesis, to the planet Kheb (“Forever In a Day”). SG-1 knows a bit about the planet, but does not know its address. The alien cloaking device technology does not work when the wearer is dead. The alien posing as Colonel O’Neill was revealed as soon as he was shot, before the device was removed. All teams returning through the Stargate will now be exposed to the high-frequency harmonic blast, used to compromise the alien cloaking technology. P3X-118, the planet where SG-6 was first replaced by the aliens, has been locked out of the S.G.C. dialing program. Colonel Maybourne’s first name is Harry. Assuming the alien devices were not destroyed automatically, the S.G.C. is now in possession of at least three of the cloaking devices (taken off the alien O’Neill, Jackson, and Fraiser). Harold Maybourne – Maybourne began with a colossal mistake: he did not follow proper procedure when Carter informed him of a foothold situation at the S.G.C., and instead turned her over to the alien intruders. But he redeemed himself by “saving the day” and bringing troops into the facility to help expel the alien incursion. O’Neill especially made an effort to thank Maybourne and reinforce him. Paul Davis – Major Davis now has first-hand experience with the dangers of gate travel and the work that Stargate Command does as Earth’s front-line protection from hostile alien forces out there in the galaxy. While his day-to-day job is to liaison between the Pentagon and the S.G.C., in the alien incursion Davis was captured, drugged, and duplicated by the invaders. 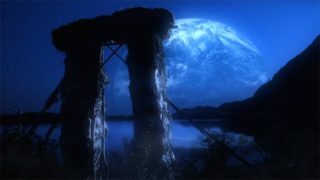 Did SG-1 find the planet Kheb, where Amonet sent her son? If so, has the child been moved again to another planet? Where are the aliens from? Another galaxy? What is the aliens’ agenda? Are they looking for a new home world to transplant their entire race, or just as a base of operations in this galaxy? Does the fact that the aliens are incurring into our galaxy imply that they have entirely conquered their own? Did the aliens specifically target Earth for their infiltration, or did they just stumble upon SG-6 and see them as an opportunity? Where are the members of SG-6? Dead, or left alive back on the planet where the aliens attacked them and took their place? Will a team be sent to find them? If the members of SG-6 were left alive, do the alien memory transmitters work across great distances (multiple star systems away), or did the aliens posing as SG-6 simply not have access to their thoughts? Were there any other aliens on Earth outside of the Cheyenne Mountain Complex? (Three of the aliens — O’Neill, Jackson and Davis — did make it outside the mountain.) If so, are these aliens now dead? What did the leader of the alien infiltrators say in his speech in the gate room before self-destructing? Were the aliens who escaped through the gate destroyed just like the rest of the aliens throughout the base? Did the aliens leave anything behind to be studied? Any corpses, such as those of the aliens who impersonated Jack, Daniel, Dr. Fraiser or Major Davis? Would it not be fairly easy for the aliens to change the frequency used by their cloaking technology, rendering Carter’s tone ineffective in scanning teams coming through the Stargate? VOTE! How would you rate SG-1's "Foothold?"